Amid surging competition in online grocery services, Peapod said it’s “doubling down” on its value proposition for consumers with new savings, delivery and meal kit options. The Ahold Delhaize USA online grocer on Thursday announced everyday price cuts on thousands of products, including natural and organic items, meat, fresh produce and dairy. The changes will show the old price slashed with the new, lower price. In addition, customers will see flags highlighting further savings via weekly promotions on many items. For products typically purchased together, Chicago-based Peapod is introducing “Bundles of Savings.” Peapod said it mined its transaction data to create easy-to-shop product bundles. Added discounts are applied when customers buy a certain number of items within a product group. Already-popular bundles include Taco Tuesday, Spaghetti Thursday, Morning Coffee On-the-Go and Salad Fixings. Shoppers who like to stock up on certain products — such as berries, eggs and frozen vegetables — can take advantage of “Buy More Save More.” The new program serves up savings when customers purchase two, three or four products within a given category, and they can mix and match products to get the savings. According to Peapod, such bulk-buying discounts normally aren’t offered by traditional grocers and enable shoppers to assemble custom club packs. "When planning the reductions, we began with one important question: What do our customers care about the most?” Spencer Baird, senior vice president of merchandising at Peapod, said in a statement. "It sounds simple, but we wanted to ensure we are giving our customers exactly what they want at the value they expect. Initial feedback has shown shoppers are very happy with the new value Peapod is delivering." The new value-focused offerings also include the launch of PodPass MidWeek, a discounted version of the PodPass free-delivery subscription. 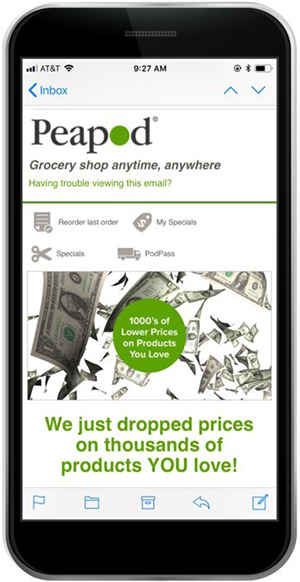 Peapod said PodPass MidWeek costs $55 — half the price of the regular subscription — and offers a year of free deliveries on Tuesday, Wednesday or Thursday, representing a $300-plus annual savings for customers who order weekly. The service is offered in subscriptions of three months ($25) and six months ($35) as well. Also on Thursday, Peapod said it’s expanding its lineup of meal kits through its first restaurant collaboration. The company is partnering with Lettuce Entertain You Enterprises restaurants’ Big Bowl, known for its Chinese and Thai cuisine, and Wildfire, a steakhouse specializing in chops and seafood, on three recipes: Wildfire beef tenderloin with couscous; Wildfire BBQ bison meatloaf, mashed potatoes and caramelized onions; and Big Bowl sweet and sour chicken. Offered in serving sizes of two and four, each kit contains premeasured, prewashed and prechopped fresh ingredients for a home-cooked, restaurant-quality meal made with minimal prep time, Peapod said. The new meal kits are available for home delivery starting this month in Chicago and in the New York and District of Columbia markets currently served by Peapod, which has been offering meal kits since 2014. "As the demand for meal kits continues to increase, we are thrilled to collaborate with restaurants like Wildfire and Big Bowl," Baird said. "It was a natural progression to work with trusted and popular restaurants based right here in Peapod's hometown of Chicago, and we are excited for our customers to be able to make these delicious recipes right at home." Overall, Peapod serves 24 metropolitan markets in New York, New Jersey, Connecticut, Rhode Island, Massachusetts, New Hampshire, Illinois, Wisconsin, Indiana, Pennsylvania, Maryland, D.C. and Virginia. Its online delivery serves homes and business and has more than 200 pickup locations.